The Philharmonia Baroque Orchestra (PBO) opened their 38th season this weekend with a series of concerts in Bay Area (and a single traversal to Costa Mesa to begin the Philharmonic Society of Orange County 65th season) called “Mozart Magnified”, featuring three of Mozart’s sacred works from his time in Salzburg. These concerts came right on the heels of the announcement that the PBO Music Director, Nicholas McGegan, would retire at the conclusion of 2019-20 season, by which he would have led PBO for 35 years. Personally, the news of McGegan’s retirement came as quite a shock to me. In all these years I’ve been PBO’s subscriber, his conducting could be described with one word: “dependable.” No, among all those period-instrument champions, he wasn’t the most energetic or aggressive, but there was a certain charm and joy emanated from him every time he was on that podium, and I believe that was drawing the audience to keep coming back to see him and the orchestra. After all, as the PBO Executive Director Courtney Beck proudly announced prior to this concert, this season saw 91% of the subscribers renew their memberships, and more than 400 new subscribers joined in. Obviously, with such a wide range of composers, the result could be variable; I thought his Rameau from two years back was rather dreary, but it was probably caused by my own overhyped expectation. Still, his departure will be greatly missed by me. In his wonderfully detailed program notes and animated lecture before the concert, Philharmonia Baroque Chorale’s director Bruce Lamott explained how significant were the Salzburg years for Mozart’s musical development amidst his growing frustration with Archbishop Colloredo. The evening began with a rarely performed choral work that I wasn’t familiar with, Litaniae lauretanae in D Major, K. 195. The Loretan Litanies of the Blessed Virgin Marywas composed in 1774 for the Salzburg Cathedral. It consists of five movements, namely Kyrie, Sancta Maria, Salus infirmorum, Regina angelorum and Agnus Dei, to be performed in succession (unlike the movements of a Mass). The title refers to the Basilica della Santa Casa in Loreto, Italy, believed to be the site where angels relocated the Nazareth house of the Virgin Mary to save it from the Muslim reconquest of Palestine. K. 195 was actually Mozart’s second setting of the text; the first (K. 109) came three years prior. During his interview with the Los Angeles Times, McGegan himself mentioned that this was the first time he conducted Litaniae lauretanae. As always, he led the orchestra with assured hands and confidence. From the very beginning it was obvious that the Philharmonia Baroque Chorale would be the star of the night; their sounds blended harmoniously, all the way from the hushed quiet whispers to the thickest wall of sound. McGegan was supported with four excellent soloists for the Litaniae; soprano Camille Ortiz, mezzo-soprano Meg Bragle, tenor James Reese, and bass-baritone Dashon Burton. The four singers all had distinct voices, and they complemented each other nicely. Bragle, a frequent Bay Area performer, sang with her familiar expressivity. The biggest discovery of the night for me was tenor James Reese. His clear voice, the brightest of the lot, was so effortless, especially in the difficult “Regina angelorum.” Big-voiced Burton completed the quartet, though it was a shame he didn’t have much to sing. After the Litaniae, came the second piece before intermission, the famous motet for soprano and orchestra, “Exsultate jubilate,” K. 165, performed by Ortiz. 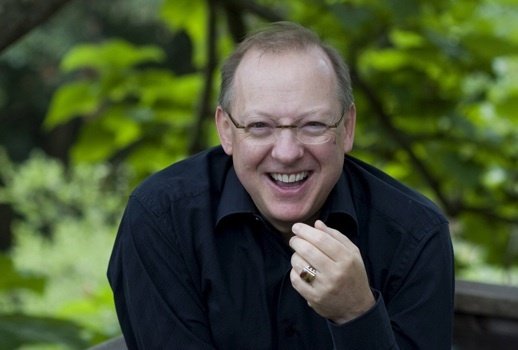 In article linked above, McGegan quipped that he had done this piece 12 times with six different sopranos prior to this performance, and that familiarity showed in his conducting. He demonstrated authority and deep understanding in leading the somewhat brisk interpretation. The woodwind sounded particularly beautiful that night, particularly in the “duet” with the soprano in the first movement. As I mentioned before, Ortiz had dark coloratura voice, quite possibly the darkest I had ever heard in this music. This kind of changed the interpretation for me, hers was a full-grown woman rejoicing, instead of the childlike innocent of the usual canary songbirds. Her stunning appearance in bright red gown reinforced that notion. She sailed through the many difficult parts of the motet, particularly in the outer movements, and capped both with virtuosic cadenzas. After the intermission came the main event of the evening, Mass No. 15 in C major K.317, “Coronation”. I have a personal affinity with this Mass. Eons ago, when I was moonlighting as church organist, I had the opportunity to do an organ reduction of the orchestra and organ continuo when my choir decided to perform this Mass for a Christmas Vigil mass. To this day, it was still the crowning achievement of my short-lived organist period. I did spend a lot of times listening to the Trevor Pinnock’s recording to distill the most prominent parts to be highlighted. Therefore, I had certain expectation about how the Mass should be played. McGegan and PBO and Chorale (largely) delivered the goods splendidly. He brought a sense of urgency and vitality to the brisk reading of the score. I consider the Mass an economical piece that packs a lot of punches; it’s a study of dynamic contrasts, a perfect balance of symmetry and harmony; and a kaleidoscopic blend of emotions and mood changes. Personally, I prefer a brisk reading of the Mass and I’d rather have it performed by period-instrument bands than modern orchestras; “grand” wasn’t the adjective I like to put for this beloved Mass. To me, the “Kyrie” of the Coronation Mass is one of the dramatic Kyries of all Masses, second only to Haydn’s Lord Nelson Mass. The opening Kyrie eleison, with its emphasis on the syllable “Ky” (marked forte on the score) and de-emphasis on “ri-e” (piano on the score), needs this such a contrast to make an impression; and the Philharmonic Baroque Chorale followed this to a T. The subsequent call-and-respond duet between the soprano and the tenor was particularly lovely as Ortiz and Reese’s voices contrasted and complemented each other. The four soloists really brought out that effect loud and clear, with precision and perfect timing. I had to specifically give a shout out to the trumpet section, oftentimes the weakest link of PBO. They were perfect in sync with the orchestra and in tune, provided the much needed declamatory accents for both the Gloria and the Credo. If I may nitpick, I wish McGegan would have performed the opening section of “Sanctus” slower, more maestoso. The faster tempo robbed the performance of all these subtle effects, in my opinion. No problems on the Benedictus, the quartet performed it with sotto voce, exactly as described by the score. The interrupting “Osanna in excelsis” was sufficiently startling. By taking a faster speed than usual, McGegan and Ortiz successfully managed to avoid that trap. The Chorale then attacked the final “Donna nobis pacem” with the same intensity as the opening “Kyrie,” bringing the performance gloriously full circle.